Reading the last one hundred pages of John Fowles's “The French Lieutenant’s Woman” is like being caught in a fictional labyrinth. We think we know where we stand in the story, and who the characters are and what possibilities are open to them, and then Fowles begins an astonishing series of surprises. He turns his story inside out, suggesting first one ending, then another, always in a way that forces us to rethink everything that has gone before. That complex structure was long thought to make Fowles's novel unfilmable. How could his fictional surprises, depending on the relationship between reader and omniscient narrator, be translated into the more literal nature of film? One of the directors who tried to lick “The French Lieutenant’s Woman” was John Frankenheimer, who complained: "There is no way you can film the book. You can tell the same story in a movie, of course, but not in the same way. And how Fowles tells his story is what makes the book so good." That seemed to be the final verdict, until the British playwright Harold Pinter tackled the project. Pinter's previous screenplays, such as “Accident” and “The Go-Between,” are known for a mastery of ambiguity, for a willingness to approach the audience on more than one level of reality, and what he and director Karel Reisz have done with their film, “The French Lieutenant’s Woman,” is both simple and brilliant. They have frankly discarded the multi-layered fictional devices of John Fowles, and tried to create a new cinematic approach that will achieve the same ambiguity. Fowles made us stand at a distance from his two doomed lovers, Sarah and Charles. He told their story, of a passion that was forbidden by the full weight of Victorian convention, and then he invited us to stand back and view that passion in terms of facts and statistics about, well, Victorian passions in general. Pinter and Reisz create a similar distance in their movie by telling us two parallel stories. In one of them, Sarah Woodruff (Meryl Streep) still keeps her forlorn vigil for the French lieutenant who loved and abandoned her, and she still plays her intriguing cat-and-mouse game with the obsessed young man (Jeremy Irons) who must possess her. In the other story, set in the present, two actors named Anna and Mike are playing Sarah and Charles. And Anna and Mike are also having a forbidden affair, albeit a more conventional one. For the length of the movie's shooting schedule, they are lovers offscreen as well as on. But eventually Mike will return to his family and Anna to her lover. This is a device that works, I think. Frankenheimer was right in arguing that just telling the Victorian love story would leave you with É just a Victorian love story. The modern framing story places the Victorian lovers in ironic relief. Everything they say and do has another level of meaning, because we know the "real" relationship between the actors themselves. Reisz opens his film with a shot that boldly states his approach: We see Streep in costume for her role as Sarah, attended by a movie makeup woman. A clapboard marks the scene, and then Streep walks into the movie's re-creation of the British coastal village of Lyme Regis. "It's only a movie," this shot informs us. But, of course, it's all only a movie, including the story about the modern actors. And this confusion of fact and fiction interlocks perfectly with the psychological games played in the Victorian story by Sarah Woodruff herself. The French lieutenant's woman is one of the most intriguing characters in recent fiction. She is not only apparently the victim of Victorian sexism, but also (as Charles discovers) its manipulator and master. She cleverly uses the conventions that would limit her, as a means of obtaining personal freedom and power over men. At least that is one way to look at what she does. Readers of the novel will know there are others. 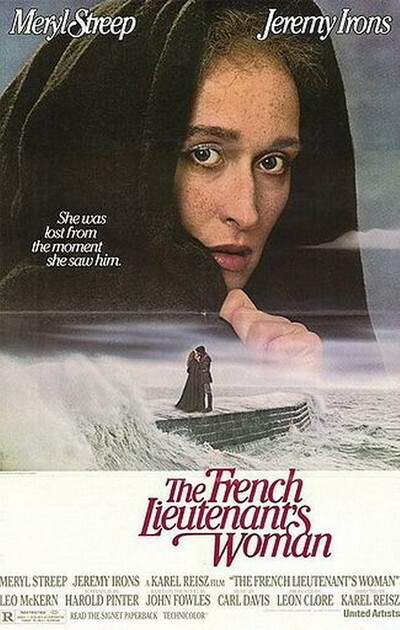 “The French Lieutenant’s Woman” is a beautiful film to look at, and remarkably well-acted. Streep was showered with praise for her remarkable double performance, and she deserved it. She is offhandedly contemporary one moment, and then gloriously, theatrically Victorian the next. Opposite her, Jeremy Irons is authoritative and convincingly bedeviled as the man who is frustrated by both of Streep's characters. The movie's a challenge to our intelligence, takes delight in playing with our expectations, and has one other considerable achievement as well: It entertains admirers of Fowles's novel, but does not reveal the book's secrets. If you see the movie, the book will still surprise you, and that's as it should be.